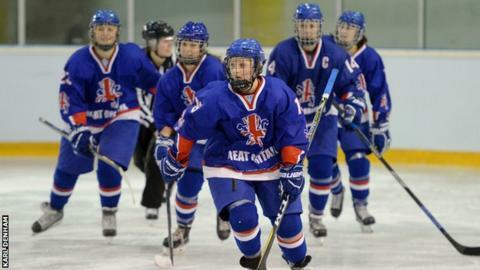 Great Britain missed out on promotion after finishing second in Division Two Group A of the 2019 Women's World Championship. The matches took place at the Ice Bowl in Dumfries, Scotland, with Slovenia finishing first to gain promotion to Division One Group B.
Netminders: Samantha Bolwell (Kingston), Nicole Jackson (Gothenburg). Defence: Lucy Beal (Bracknell), Jodie Bloom (Solihull), Georgina Farman (Brynas), Verity Lewis (Ontario Academy), Susanna Pearson (Salve Regina), Beth Scoon (Kingston), Abbie Sylvester (Bracknell), Casey Traill (Castleton University). Forwards: Louise Adams (Gothenburg), Saffron Allen (Solihull), CJ Ashton (Kingston), Abigail Culshaw (Whitley), Shannon Douglas (Maine NCAA), Aimee Headland (Northwood), Chloe Headland (RSL Islanders), Beth Hill (Guildford), Kimberley Lane (Bracknell), Katie Marsden (Trinity College NCAA), Monica Petrosino (Guildford), Stephanie Towns (Whitley Bay).